First there was Cinderalla... then there was Hansel and Gretel... now, the third and final piece in Junko Mizuno's full-color fractured "fairy tales" series, Princess Mermaid! In this dark-hued ocean fable, three beautiful and seductive mermaid sisters, Tara, Julie, and Ai, lure unsuspecting sailors into their underwater pleasure palace only to...eat them!?! Crazed with vengeance for human atrocities against their mother, these mermaid sisters have sworn to kill...but things take a twist when Julie falls for the all-too-human Suekichi, and the two lovers find themselves in the middle of an inter-special feud. Will Julie find true love? Or will the double-dealings of the lusty Dragon of the deep take things in a whole other direction? 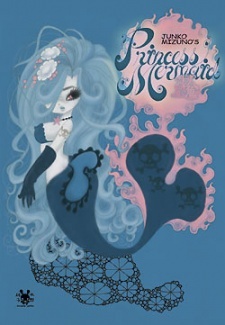 Ningyo Himeden was published in English as Princess Mermaid by VIZ Media on December 31, 2003.